It’s the last thing in the world Raiders owner Mark Davis wants. But sometimes the most difficult course of action is exactly what one should do. I’m talking about the pathetic state of the Raiders franchise, and how it can be solved. I sat in the Oakland Coliseum stands on Sunday during the Raiders’ 42-28 defeat to a mediocre Colts team. It was ugly. And more than a little sad. The team’s 4th-quarter collapse was so predictable, the muted reaction and gallows humor from fans around me indicated that they expected it. Such are the coping mechanisms of a tormented fan base that has come to view losing as inevitable. It begs the question: How can the people who currently run this flagging franchise fix it? Here’s my suggestion: Mark Davis should sell the Raiders. He’s clearly unfit for the job of team owner. If Davis loves the Raiders as much as he claims, he should set the franchise free. This is the seventh full season that Davis has run the Silver and Black. It will be the sixth season that ends in a losing record. In five of those seven seasons, the team has not just been bad, they’ve been unwatchable. The Raiders’ record in the Mark Davis era, thus far, is a woeful 37-66. The team has already had four head coaches in that brief time. And that’s not even counting Hue Jackson, whom Davis and general manager Reggie McKenzie fired after the 2011 season. You remember McKenzie. He’s the guy Davis hired — after one interview with one candidate — to run the most important part of a multibillion-dollar corporation. Davis’ lazy, underwhelming executive search has led to underwhelming results. The Raiders’ on-field product since then has been mostly an embarrassment, reflective of an incompetent franchise forever mired in dysfunction and instability. Most of McKenzie’s draft picks and free agent signings have been misses, not hits. Even his few successful acquisitions — drafting Kahlil Mack, Derek Carr, and Amari Cooper and signing free agent offensive linemen Kelechi Osemele and Donald Penn — have been traded, injured, or placed on the trading block after beginning to underperform. Poor Derek Carr, the team’s embattled $125 million quarterback, has had to adjust to a new offensive coordinator in almost each of his five NFL seasons. And it shows. Carr’s play showed improvement on Sunday against the Colts, throwing three touchdowns and rushing for another. But all too often this year, his play has ranged from uneven to awful. As a result, reports have trickled out of the Raiders’ dissension-filled locker room that Carr has lost his teammates’ respect. It’s possible, even likely, that Gruden will trade Carr this offseason and continue the team’s second roster rebuild in the past half-decade. Ah, yes, Gruden. What the hell happened to Chucky? I’ve been a fan of his since 1998, when his fiery charisma revived a once-moribund Oakland franchise. Twenty years later, I don’t recognize the guy. 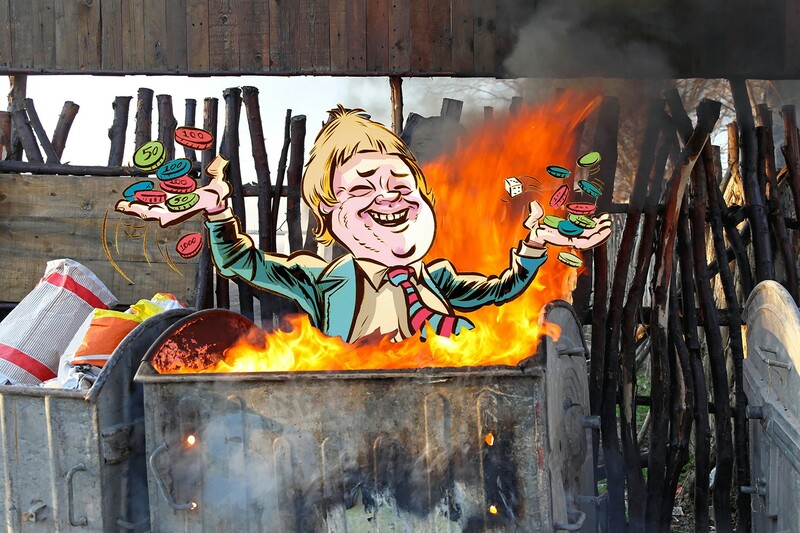 It’s been painful to watch fans and sportswriters openly mock the once-formidable Gruden as he’s clumsily tried to explain his growing number of questionable trades and failed game plans. Gruden can still coach. But he never succeeded as a player personnel evaluator in Tampa, and he’s off to the rockiest of starts in that role again in Oakland. Coaching and being a general manager call for two different skill sets. Fire, stubbornness, and impatience are assets in coaching. Not so much for front office executives, where coolly shrewd thinkers and cunning long-range planners rule the day. Gruden has shown how one can be really good at one of those jobs and fail miserably at the other. I believe few coaches know football X’s and O’s as well as Gruden. But can he still motivate players? Can he maintain their trust long enough to lead them into gridiron battles? I’m not so sure. In Tampa, it took Gruden six seasons to lose his players’ faith. In Oakland this year, it’s taken just six games. The Amari Cooper trade last week led to another Gruden misstep. He reportedly told ESPN about the deal that sent the wide receiver to Dallas before speaking with his own Raiders players. Bad move. Unfortunately, there’s more. After losses this year, Gruden has publicly criticized Carr and other players, appearing to shirk responsibility for the team’s humiliating losses. None of which goes over well in a locker room full of proud athletes innately suspicious of a phony. Some fans point to the future, saying the recently acquired draft picks from the Cooper and Khalil Mack trades will help Gruden build a winner. You sure about that? I’m not. What good is stockpiling draft picks if your coaching style is just going to alienate current and future players? And what proof is there that this front office is able to deliver future all-stars in the draft? And don’t talk to me about the team’s $74 million in salary cap space next offseason. The Raiders had more than $50 million in cap space last spring and they totally misspent that money on several washed-up veterans who’ve contributed little. I have little faith that Gruden and his staff won’t screw it up again next offseason, either in the draft or free agency. Also, McKenzie’s clout within the organization has shrunk amid reports that he and Gruden have clashed over recent personnel decisions. Few would be surprised if McKenzie is no longer with the Raiders in a few months, even though he has two years left on the extension Davis awarded him after the 2016 season. See the pattern? More exits. More instability. More backstabbing. More finger-pointing. More humiliating losses. For a guy who loves to talk about “Raider family” and “loyalty,” there sure seems to be a distinct lack of the stuff with Davis at the helm. What’s the best way to explain the current disheveled state of the Raiders, a once-proud franchise that has put its loyal Oakland fans through endless talk of franchise relocations and 15 non-winning seasons in 16 years? It all starts at the top. Al Davis accomplished many things in his football life. Grooming his son to take over apparently was not one of them. Mark Davis simply doesn’t know what he’s doing. The team owner considers himself a born Raider, but he doesn’t know how to translate his affection for the Silver and Black into actions that build a winner. If one looks honestly at all the ailments afflicting this franchise’s front office, the Oakland Coliseum is the least of its problems. Yet if all goes according to Davis’ plan, the Raiders will move into their Las Vegas stadium in 2020. That’s the stadium deal in which Davis has received $750 million in public money while agreeing to go around $1.2 billion in debt on the project. If that sounds like a stupid thing for Davis to do, that’s only because it is. Davis’ Vegas stadium venture will turn out like a lot of weekends in Sin City: An exciting first few days, followed by years of regret. After watching this franchise flail for most of seven seasons under Davis’ watch, I have no faith that a new venue can turn the Raiders into a winner. If anything, it will bring a new slate of problems, as moving a team hundreds of miles away from most of its fans tends to do. Mark Davis could have asked the team’s previous owner how badly that went for the Raiders in 1982, when Al Davis relocated the team to Los Angeles. That move left a damaging scar on the franchise, one that has never fully healed. Indeed, a team filled with old Oakland Raiders players won Super Bowl XVIII in the team’s first full season in Southern California. Thirty-five years later, the Raiders have yet to win another NFL championship. And they don’t seem close to even contending for one in the foreseeable future. A franchise once known for pride, poise, and glory is now only known for losing and moving — and those two factors are closely connected. Mark Davis could spare Raiders fans from all of this. He could avoid repeating his father’s errors with one simple step. He could sell the team. He doesn’t have to sell all of his shares, of course. Davis could make a mint and still stay connected to the team and the NFL by keeping a minority interest. But by ceding control of the Raiders to a competent owner — someone with a strong business acumen and deep pockets — Davis would be removing the biggest obstacle to the Raiders’ return to glory. That obstacle is him. I doubt that Davis has the humility to go in that direction. But if he truly wants the Raiders to consistently win again, he should take one simple step and do it as soon as possible. Mark Davis should sell the Oakland Raiders.